It was my first trek to the Himalayas. Naturally, I was jumping up and down in my room with excitement, until the day arrived for the trek. The beautiful Himalayas had been on my mind since I had read about them in schools. Kuari Pass is a breathtaking pass located amidst the majestic Himalayan mountains, spread across the northern part of the beautiful state – Uttarakhand. It was popularised by one of the Governor General – Lord Curzon of the pre-Independence era. Ever since this place has been drawing travelers from all across the globe. This trek is done mostly during winter. The trek was to start from Haridwar, and our group reached Haridwar at night. We stayed overnight in Haridwar after catching up on a simple yet delicious dinner. The next day began early at 5.30 in the morning. After meeting the other trekkers, our journey began. It is an entire day journey from Haridwar to Joshimath. Having lost my excitement briefly – thanks to the adverse cold weather – I had no high anticipations today and had planned to catch on my sleep until I reached. But, it was not long before that I got to know what a foolish thing that would have been! The views were so breathtaking all along that I never did once try to fall asleep. The landscape was amazingly beautiful with each passing town looking more and more brilliant. 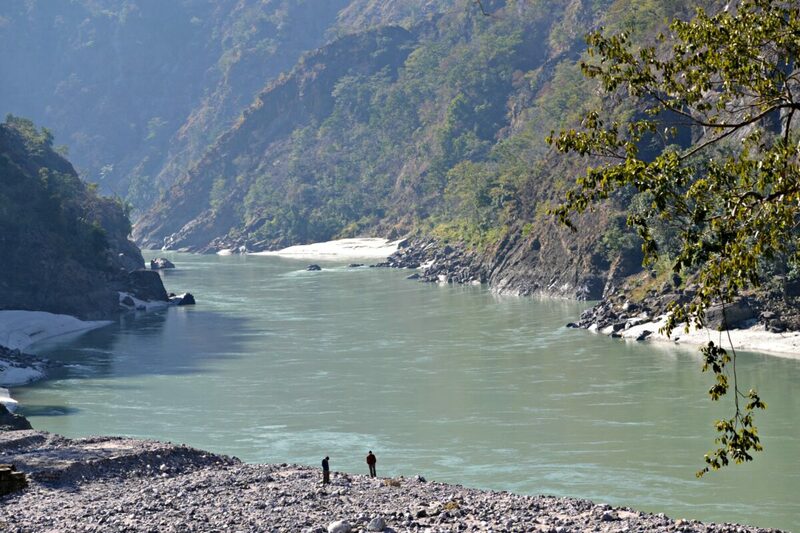 The mesmerising river Ganga was flowing all along as if leading the way to some mystical place uphill. People call her by different names in different towns. She is known as the Alaknanda, Pinder, Nandakini and Kaliganga. The river makes its way through the mighty hillside in some place and flows through the rocks and the dense forest the other times. She adds so much beauty to the place making it just picture perfect. With the mother nature offering such a grand vision, I sat upright through the entire journey looking through the window, even forgetting sometimes to blink my eyes. We reached Joshimath at around 8 in the evening. Joshimath is located in Chamoli district, tucked away from the mainstream civilised life and is in all sense an idyllic town. It is at an altitude of about 3600 meters and nestles at the foot of the stupendous Himalayas. It is the starting point for various treks and pilgrimage in Uttarakhand. The town wears a very simple yet fulfilling look, and it is the place which offers the first glimpse of the great Himalayas. 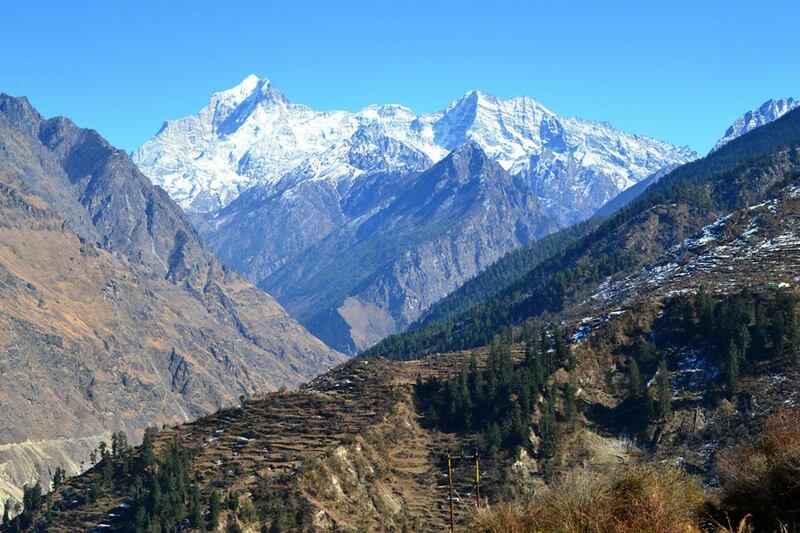 Any adjectives, metaphor or jargon, fails to describe the beauty of the Himalayas. I will never forget my first look at these mountains.There were tears of happiness in my eyes and my heart with wonder as I had finally made it! It seemed as if these majestic mountains beckoned me with a smile,offering me to show a paradise on Earth that I was about to see. The actual trekking began on this day, where we were supposed to reach our first base camp at Chitrakhana. The freezing weather continued to taunt us, and every little act had become weary. We headed off early as we were told by our trek leaders that we would not be hiking after 5 PM as the sun would set by then. So we drove for about 12 km from Joshimath to the starting point of the trek. We began the ascent which was rocky and steep. After cautiously treading the path set by our guides for about 2 km, we reached a narrow trail that led to a remote village – Tugasi. Tugasi is a small village inhabited by kind, hardworking, straightforward and friendly people. After resting for some time and chatting with the bubbly kids, we trekked ahead for another 2 km and reached the Chitrakhana top. As we ascended higher, the views changed every time. The tall pine trees formed a canopy over the snow bed, and it was a sight to marvel. We spent the rest of the day in acclimatising to the high altitude and exploring the place around. Day 3 of the trek started at 8.30 in the morning. Although the trek was categorised as easy to moderate, the unexpected snowfall a few days ago had made it more difficult. Thick snow ran till knee deep, making it tedious to take even simple steps. The 8 km trek was cut short as the snowfall had cleared the trail making it inaccessible. We camped that night in some place in between Chitrakhana and Tali top. By now, we had bonded pretty well, and we lazed and chatted our way to sleep! We started off from the Tali top to reach our intermediate place Khullara. Although the snow was still thicker, we were accustomed to it and in fact had a bit of fun too! 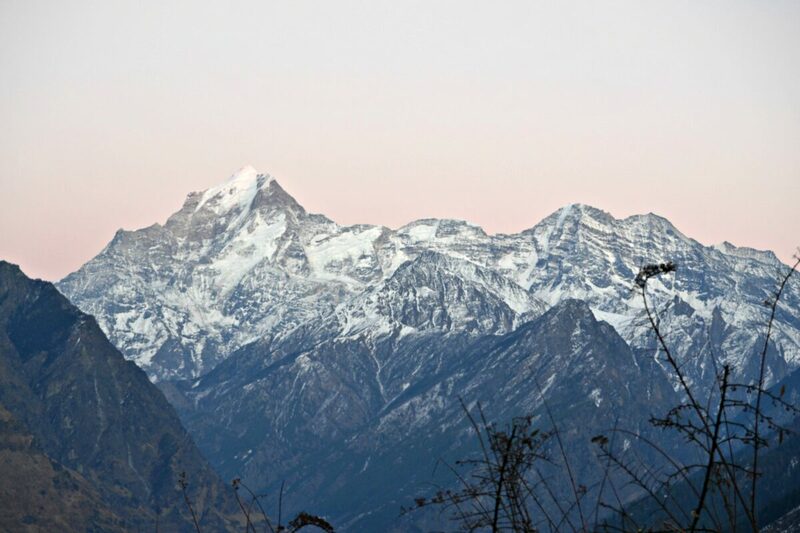 It is from Khullara where you can see the wonderful peaks – Nandadevi, Nilakanth, Trishul and Dronagiri. These mountains are at an altitude of 7500 meters. This altitude provides a panoramic view of the brilliant mountains standing tall against a splendid backdrop of skies. No, the pic isn’t edited. It’s just the unbelievable beauty of the Himalayas! I was swept off my feet by these gigantic and magnificent mountains. It felt like I could look at this forever. The sunlight played with the canvas of colors on these peaks and the fleeting colors made me feel like scrolling through a colorful album. No matter how long I gazed at them, the views were insatiable to me. Heavy snowfall prevented us from reaching the Kuari. But, I had nothing to lose. Because I had fallen in love with these mountains head over heels and I reveled in its beauty. The nights are as beautiful as the days are in the mountains. The sky is crystal clear and cloudless and the constellations of stars seem like a masterpiece crafted by a genius creator. This splendid sky combined with the serenity can make one go into meditation! Some things can only be experienced and cannot be explained. The nights I spent here were one of that kind. We had super fun all night, talking, teasing, debating, and playing games beside the fire. 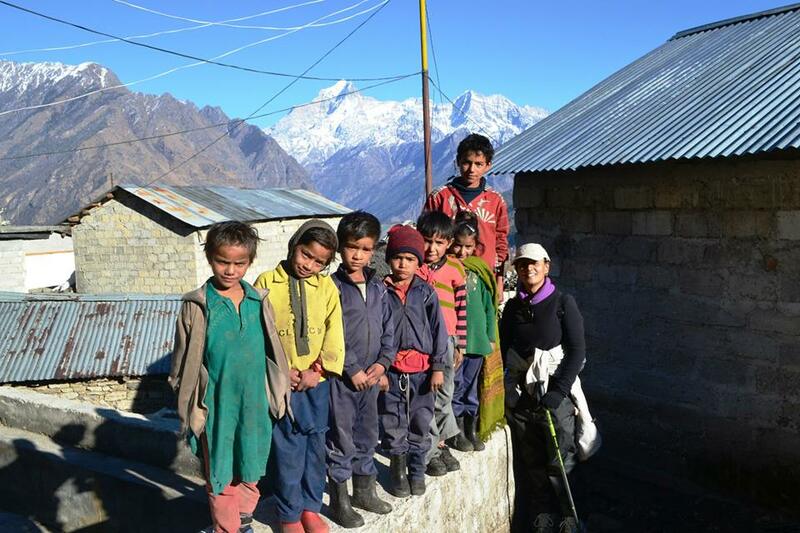 After spending few beautiful days in the wonderland of the Himalayas, we started the descend with a heavy heart. It was mixed emotions – happy for being here, sad for leaving this place and not being able to stay here. In the evening we reached Joshimath and stayed there overnight. We drove to Haridwar from Joshimath this day. With new found friends and heart warming memories, I came back.If there is one which I am sure about – that I will go again – to discover myself by exploring the hidden gem called the Himalayas. 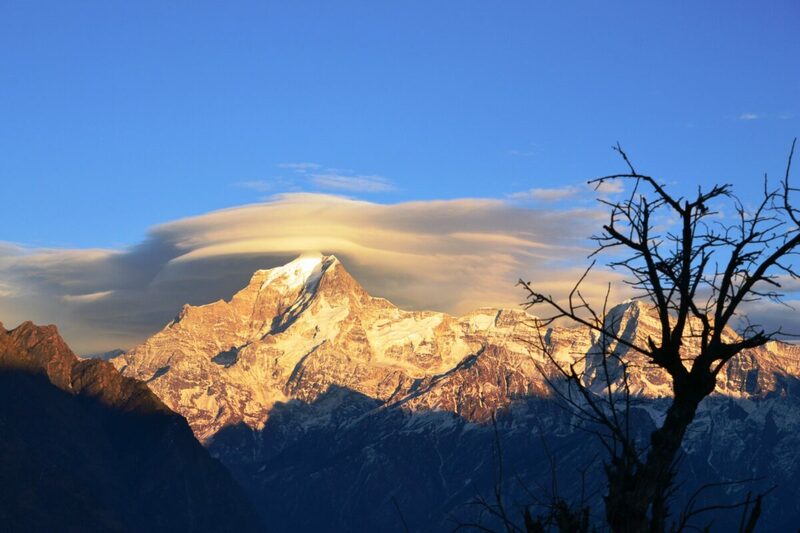 Himalayas – I bow to Thee! How To Reach Bhutan From India - How To Get To Bhutan?